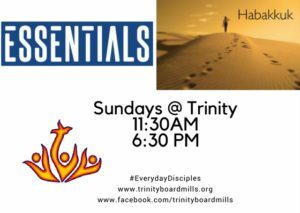 From Sunday 17th September @ Trinity join with us as we start a new journey in how we become a Disciple Making church family. Discipleship starts with awareness of Jesus before activity for Him. The essential call of discipleship is to follow our Master Jesus. We can’t do discipleship alone. We learn to follow Jesus as part of His church. Disciples don’t escape or embrace culture, but engage with it as they follow Jesus. Disciples aren’t just called to live well in culture, but also to speak up for Jesus. Following Jesus brings a cost in every area of our lives. The challenge of becoming disciples who make disciples. We never graduate from needing Jesus but continue following him in every age and stage of life.